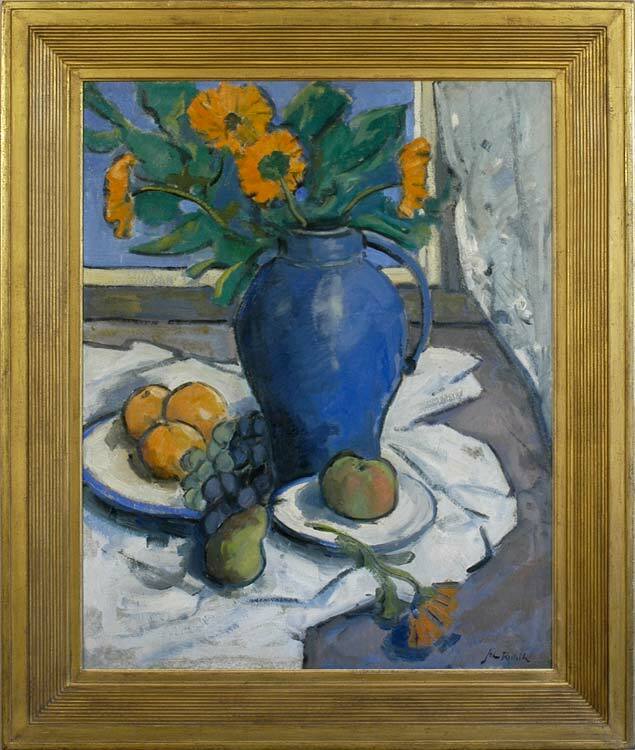 An extraordinarily bold experiment in colour, this still life is built on the tension between the complementary shades of blue and orange – the pitcher and marigolds, the Mediterranean sky beyond the window, the oranges, grapes and blue-rimmed plate. Setting these two colours side-by-side causes them to enhance each other, to add clarity to the composition, and to create a pattern which spirals diagonally up the canvas, producing an intense vibration of light and hue. At the same time the blue sky beyond the marigolds generates perspectival depth, giving a great sense of solidity and three-dimensional space to the composition, and indicating that this is the work of an artist who has perhaps been influenced by Cézanne. It is certainly the work of a very assured and self-confident craftsman. The blue pitcher appears again on one of the canvases in Riddle’s painting of a corner of his studio, Still life with flowers on stool, suggesting that he was interested in working out more of these vivid essays in the use of colours. Very little is known of John Riddle (fl. 1903-1934); even the date of his birth seems uncertain, and he is not recorded in works such as Benezit. One of his paintings, which shows a profusion of stacked canvases in a corner of his studio, indicates that he was a fairly prolific artist; the subjects of three others of his known works – Tuscan landscape, Coastal landscape with a volcano and cacti growing wild – show that he travelled in Italy. It may be that he lived there permanently, or was born there – possibly the son of diplomatic parents? – or died there, or elsewhere outside Britain. He may also, like Duncan Oppenheim [q.v. ], have followed another career to earn his living, whilst continuing to use his considerable talent for painting in his spare time.